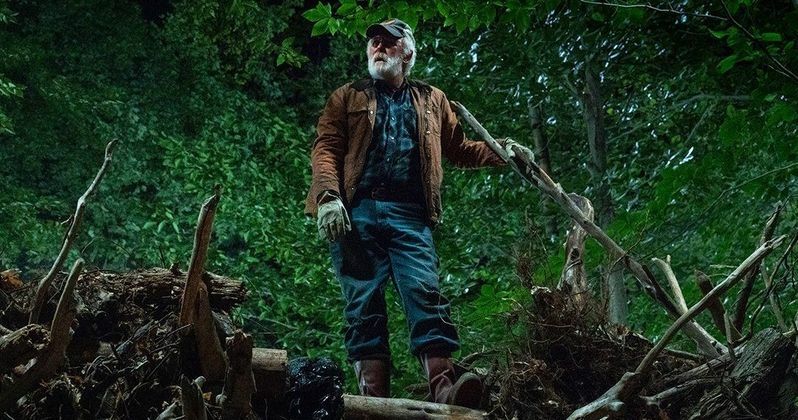 John Lithgow's Jud Crandall is featured in the latest look at the Pet Sematary remake. In the original 1989 movie, Jud was played by Fred Gwynne, who is best known for portraying Herman Munster on The Munsters TV series. While there are fans of the original movie, which turns 30-years old next year, it wasn't executed as well as some Stephen King fans were hoping for and many are looking for the remake to be the definitive adaptation. Stephen King almost didn't even publish Pet Sematary because of how dark the subject material is, but thankfully he did as it has gone on to become one of the author's most well-known books. A remake has been talked about for years, with Guillermo del Toro declaring that he would kill to make it in 2015. Even last year, IT director Andres Muschietti stated that he wanted to make the movie. However, the honor went to Starry Eyes directors Kevin Kolsch and Dennis Widmyer and the movie is preparing for release next year. Pet Sematary producer Lorenzo di Bonaventura recently spoke about the remake, and it sounds pretty promising. The first Pet Sematary trailer was released a few months ago and it looked excellent and a bit unhinged, which is more than likely what Kevin Kolsch and Dennis Widmyer were going for when they made the movie. Bonaventura had this to say about the upcoming Pet Sematary remake. "Pet Sematary is a story that shakes you to the core. Following the tense and emotional plight of this family will take audiences on a suspenseful, thrilling ride that will keep them on the edge of their seat. It's a haunting psychological horror story and watching horror is a communal experience - in a theatre, each audience member can sense the other's terror, which heightens the experience." Lorenzo di Bonaventura also revealed that he's a big fan of "psychological horror" and admits that he's really excited for fans to see the Pet Sematary remake. Kevin Kolsch and Dennis Widmyer have reportedly made something that Stephen King fans are really going to enjoy. Bonaventura says that the directors have brought their "innovative vision to the script resulting in a powerful, dark, and terrifying modern reincarnation." If the remake is anywhere near as successful as Andres Muschietti's big screen adaptation of IT, the studio will be very happy. The Pet Sematary remake already has a lot of pressure on it to stand up next to Stephen King's source material. Additionally, it will undoubtedly be compared to the latest IT remake, which is currently the highest grossing R-rated horror movie of all time. Pet Sematary hits theaters on April 5th, 2019 and IT 2 will open in theaters in the fall of 2019, telling the second half of the story. You can check out the latest image from the remake below, thanks to Fandango. #PetSematary is full of them bones.